The Imperial Hotel in Tokyo in the 1960s was a stunning structure. Designed by the legendary architect, Frank Lloyd Wright, the Imperial Hotel’s lava rock facing, the abundance greenery and the dominant reflection pool makes me think of Angkor Wat or the Taj Mahal on a more intimate scale. Known in Japan as the Teikoku Hotel, the Wright designed structure was built in the early 1920’s, opening up on September 1, 1923, the day of Japan’s most powerful earthquake ever, one that resulted in the flattening of Tokyo and over 140,000 deaths. 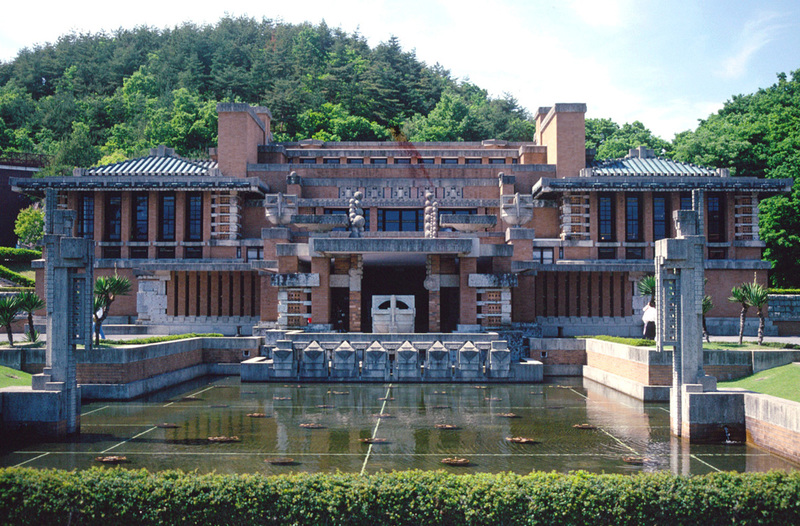 Wright had already left Japan several months before, but was proud when told that the Imperial Hotel remained standing. The ad above was published in the 1964 Tokyo Olympics Official Souvenir book, an item recently rescued from the damp and dingy garage of my old house in Queens we recently sold. The text in the ad makes the classic Japanese pitch to westerners, how their offerings are a perfect blend of East meets West. While the ad was placed to attract guests, there was actually little need for advertising. A tremendous shortage of hotel rooms in Tokyo were expected during the 1964 Olympics. According to the official report of the Tokyo Olympic Organizing Committee post-Olympiad XVIII, the International Olympic Committee, the various national Olympic committees and international sports federations were going to send a significantly large number of foreign guests to Tokyo, and they would be in need of a dwindling number of accommodations in September and October, 1964. Worried about meeting the needs of their important guests, the Imperial Hotel agreed, in 1962, to allocate 250 beds for the International Olympic Committee and the national Olympic committees. 750 beds were set aside by the Daiichi Hotel for the various international sports federations and their visitors. Nearly 600 additional beds were also reserved for the dignitaries by nine other hotels, including the Hotel New Otani, Fairmont Hotel and the Haneda Tokyu Hotel. In the years and months leading up to the Games, the hotels tried hard to get the various committees and federations to provide more exact numbers of guests. The hotels were facing increasing pressures to accommodate more tourists, but they had already made commitments for the Olympic officials. Special liaison offices were created in each hotel to help confirm the exact number of guests who were planning to arrive. In the end, many of the hotels got screwed, or perhaps a better way to say, they took one for the team. The Fairmont Hotel and Haneda Tokyu Hotel ended up filling 26% of the allocated rooms for national Olympic committee members and their guests, clearly given overly ambitious numbers. Other hotels suffered the same fate, although the Imperial Hotel, no doubt hosting the crème de la crème of the International Olympic Committee, were able to achieve 93% occupancy of rooms allocated to the Olympic and sports federation officials. By the late 1960s, the Wright-designed structure was falling into decay, part of the building sinking into its foundation. The number of rooms was woefully short of economic viability for a downtown Tokyo hotel as well. The hotel was closed at the end of 1967, and demolished to make way for a high-rise structure. For those nostalgic for the Wright-designed hotel, take a trip to Inuyama in Aichi prefecture, near Nagoya. There is a place called Meiji-mura, of the Meiji Village Museum, where historic buildings from Japan’s past are reconstructed, restored and preserved, including the entrance and facade of the Imperial Hotel. Posted in Business, Japan, Others, Pop Culture, Tokyo 1964, Tourism and tagged 1964 Tokyo Olympics, Frank Lloyd Wright, Great Kanto Earthquake, Imperial Hotel, IOC, Meiji-muira, Teikoku Hotel. Bookmark the permalink.